266 pages | 47 B/W Illus. In this accessible introduction to communication activism, organizer Karen Jeffreys and sociologist Charlotte Ryan draw on more than two decades of ongoing collaboration, using the Rhode Island Coalition for the Homeless (RICH) as a case study. The book examines a community with shared values, decision-making, and conflict resolution procedures, tracking its organizing strategy and matched communication plan. The authors first describe a communication campaign during the welfare reform battles (1990–1995) in which they began to practice communication activism. In ongoing work with two organizations over the next two decades, they distil a model of communication activism that draws directly from vibrant traditions of empowerment communication in U.S. social movements and movements from the Global South. 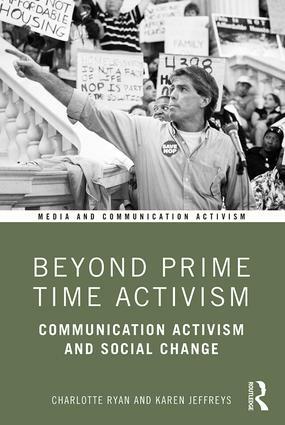 Beyond Prime Time Activism provides students and researchers with an invaluable look at contemporary activism practices and with practical tools tried and tested in two decades of social movement engagement. This book is ideal for anyone participating in social change movements or studying how they navigate communication and media inequalities. Charlotte Ryan teaches at the University of Massachusetts Lowell and codirects the Media Research Action Project (MRAP; www.mrap.info). She and Karen have worked together since 1990 in campaigns with the Coalition for Basic Human Needs (CBHN), the Rhode Island Coalition Against Domestic Violence (RICADV; www.ricadv.org), and RICH (www.rihomeless.org). Rhode-Island-based Karen Jeffreys is a lifelong social justice organizer who specializes in communication and movement building. She has collaborated with groups organizing around social services, housing and homelessness, domestic violence, media, and racial justice. She offers regular community strategy workshops for state and national social justice activists. Books in this series grapple with the recurring issues facing practitioners, teachers, students, and scholars of media and communication activism. Titles address challenges to communication activism as well as emancipatory practices that build culturally resonant, richly networked, multi-faceted, movement communication systems. Core series themes include: the power structures of media and communication activism; rights in the framework of media and communication activism; outcomes, learning and sustainable futures in media and communication activism. The editors invite brief (2-3pp.) statements of interest that fall within the scope of the series.